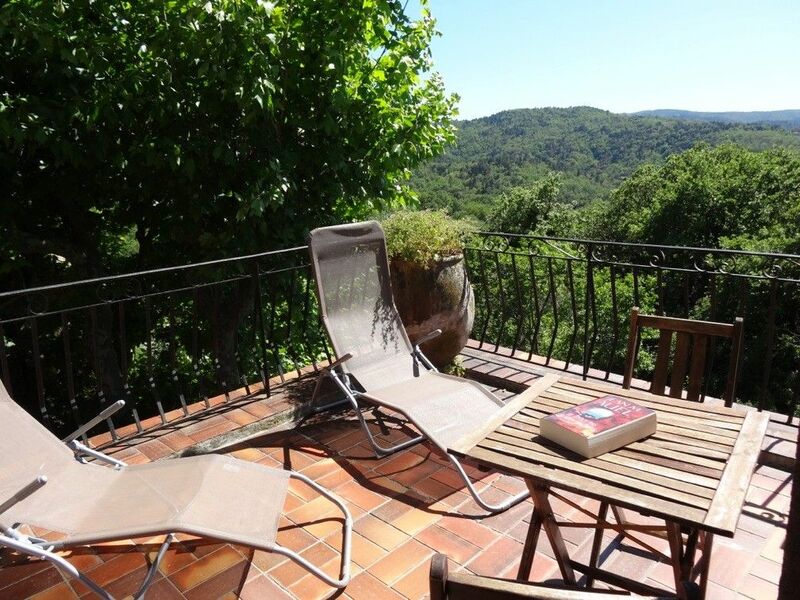 This village house on 2 levels has 2 terraces with breathtaking views of the Massif des Maures, a small walled garden. In a hamlet, it is perfect for a quiet holiday among the scents of Provence and the sound of cicadas. Its 3 bedrooms can accommodate 6 people. The sea is near. It is ideal for a family. The house of 130 m2 offers 1 living roomprovençale, 1 office with sofa bed, TV and CD player, 3 bedrooms, 1 kitchen (washing machine, dishwasher, microwave). The beds are divided between 1 bed room adjoining the solarium, 1 twin room90,1 room with 2 bunk beds. The decor is contemporary with some rustic touches. You have 1 bathroom with WC and 1WC separated. Sheets and towels can be made available. After resting in the sun or in the shade on one of the terraces, before the aperitif and the barbecue, play pétanque. The house is an ideal place for relaxation, walks in the Massif des Maures, bike rides and mountain biking. A car is necessary, the first shops and restaurants being 6 km away. Possibility of long term rental. The house is near La Garde Freinet, charming Provencal village with all amenities. 15 km from the sea, you can enjoy the charms of the Mediterranean while enjoying the coolness and serenity of the Moors (many lovely walks in autumn & spring). The famous village of Saint-Tropez and Sainte-Maxime are nearby.